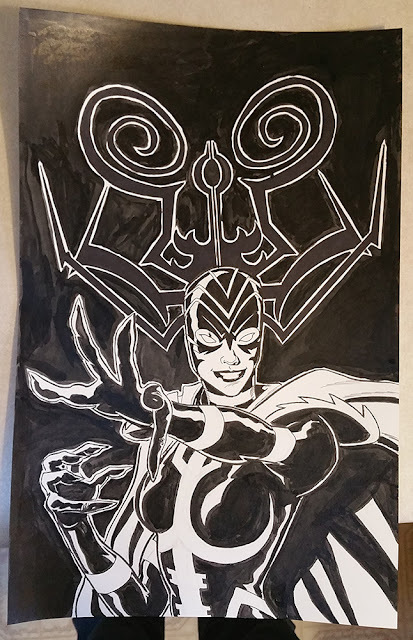 For the upcoming Heroes and Villains show at Asheville's Zapow Gallery, I made a Hela illustration, and here's how it happened. 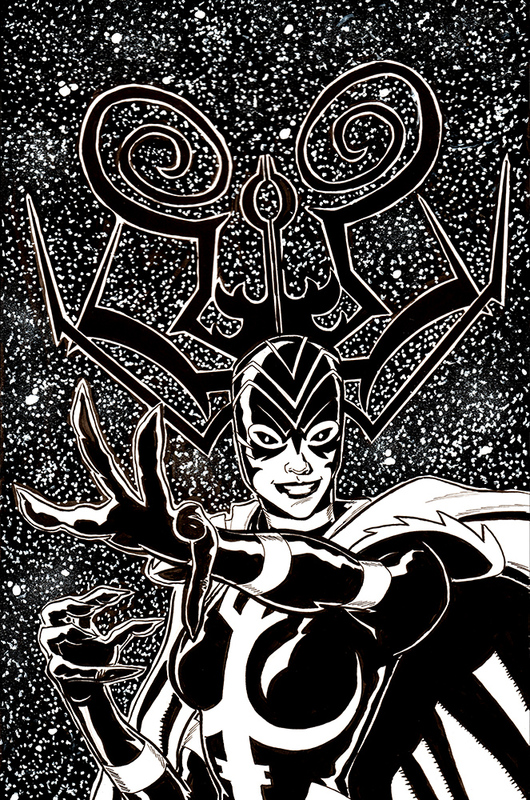 A while back, I drew a Hela for a friend and chased the idea of a skull illusion in her antlers. I couldn't make it work that time, and it bugged me. This theme show gave me a chance to try it again. I started off with very quick sketches and went quickly to reference pictures. 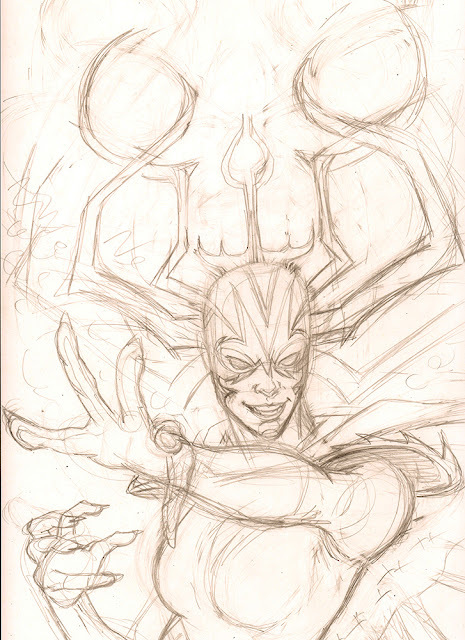 I worked up a drawing based on that and scanned it while still trying to work out those horns. This is better than I thought. Shoulda ran with it. 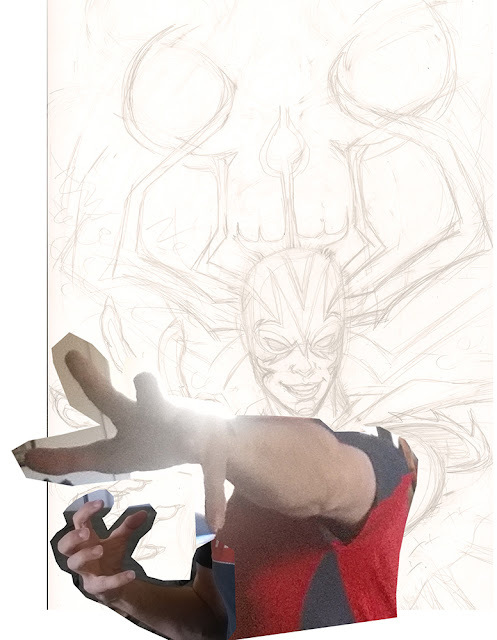 I was convinced these hands weren't right and decided to smash together my sketch and the photo reference. I printed this out at full size and lightboxed it before I realized the positioning was off, and the photos made the contours weird. I had a drawing head atop a photo body. It didn't mesh. I scrapped this and went back to my original pencils. 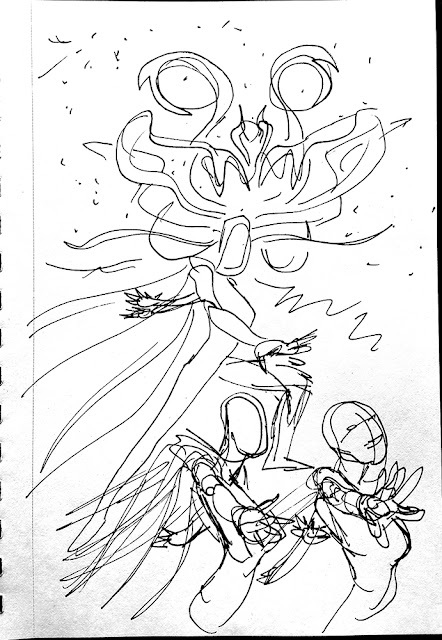 I moved the drawing up on a 11x17 document and sketched out more of the body and the costume design. I printed and lightboxed that version. Then I went to inking. The paper buckled from the ink. I worried the antlers would be lost in the black background. 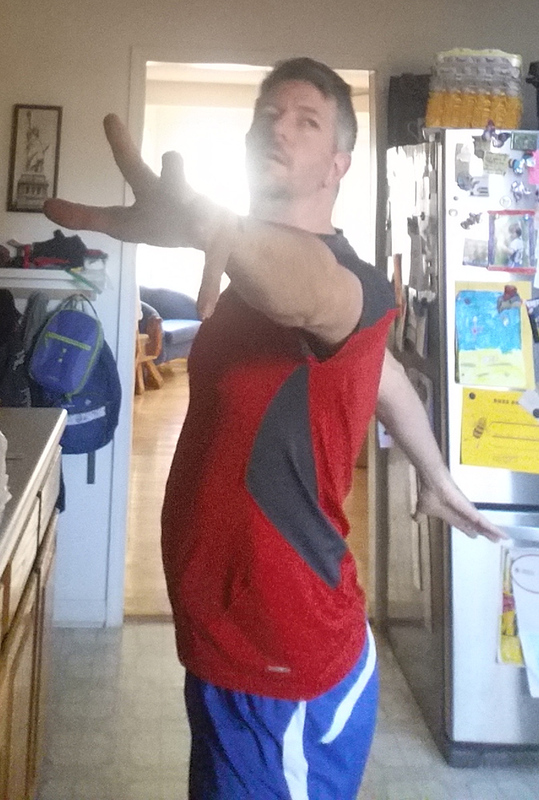 I intended to have a starfield back there, and that would take some craftiness. 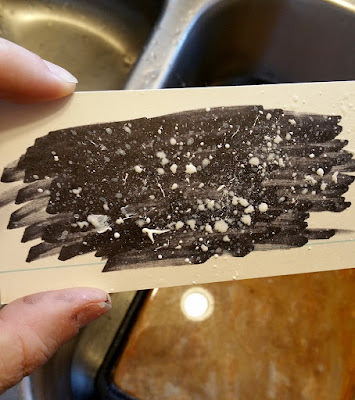 I made a couple of practice star fields by putting down ink on scrap paper and trying the toothbrush trick: You mix paint and water, dab a toothbrush into it, and run your thumb on the bristles to flick paint at the background. If the consistency is right, you can spray small dots of white and create stars. Too much water and the stars fade as the paint dries. Too much paint, and it spatters in globs. This never takes as long as it looks. 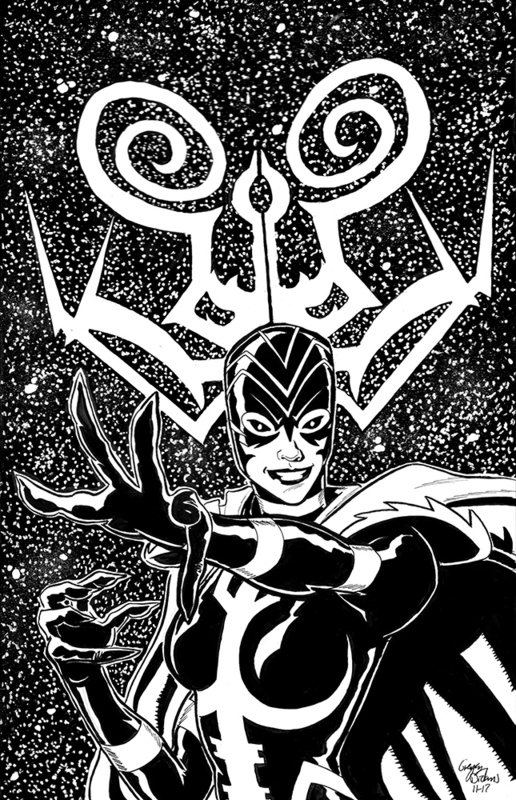 That done, I sprayed on the stars. Then I removed the mask and added more Wite-Out stars along the border of the figure. It hurts my wrist to look at this. I realized immediately the horns would be lost. I scanned the inked image you see here and played with it in Photoshop by cutting out the black antler interiors. I decided white horns would work better. 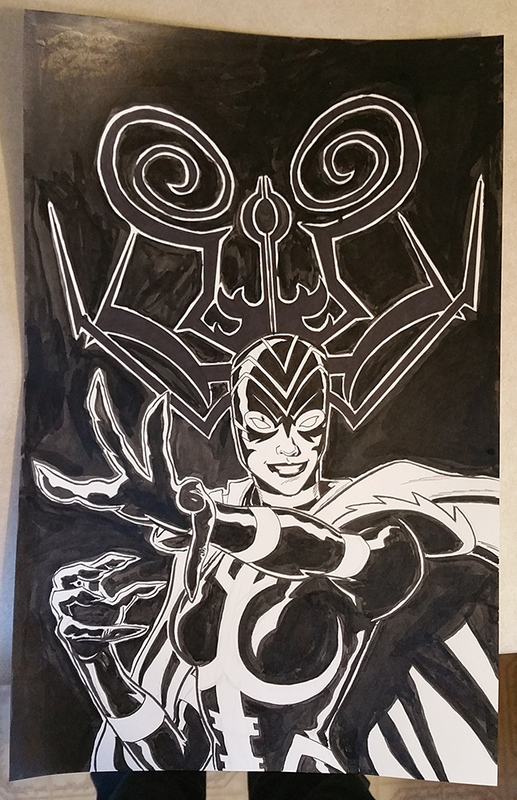 I painted over the inks with a couple of layers of Titanium White acrylic. 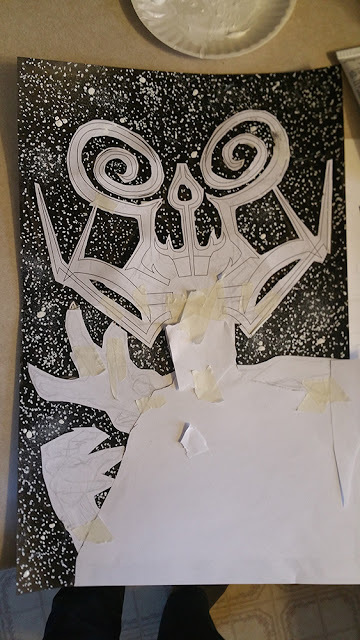 I then strengthened the antler borders by sharpening them with brushes and markers and adding stars around those new outlines. 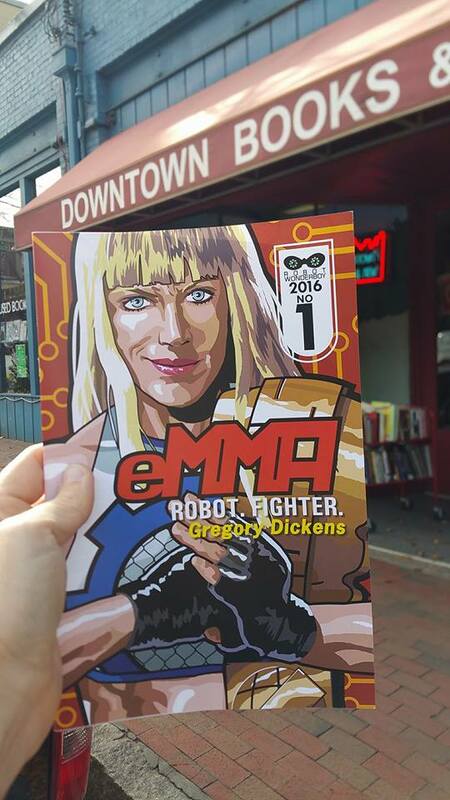 I started my Robot Wonderboy line of comics in 2010, seven years ago now, and somewhere in there I had the notion to get my books in Asheville's Malaprop's. The much beloved indie bookstore is a touchstone for the city -- a gorgeous space crammed with books and literary knickknacks. For years, I walked into that store to remind me why I was shoving around ink. I looked at the comic section to inspire my brain and competitive drive to get myself alongside the copies of Gaimans and Larsons. But that could only happen, I reminded myself, if I did the work. So let's get back to work. I can sit on the summit I marked on my map, turn around, and see how far I have climbed. I also restocked my titles in Downtown Books and News, the sister store. 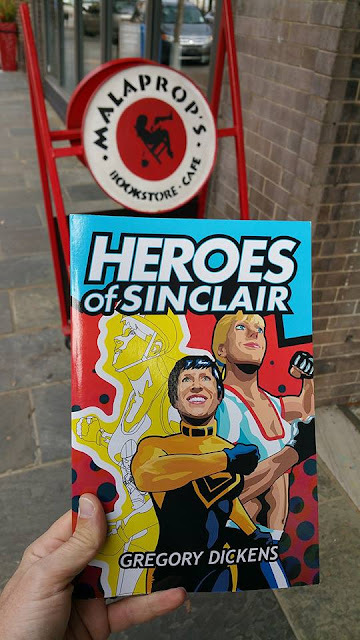 That's four local stores now with my stuff -- along with Comic Envy and Highland Books -- and that's a heady realization. Learn from me, guys. Heads down, pencils sharp. Do the work.